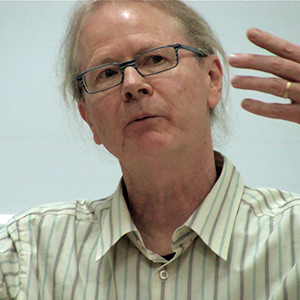 Iain Chambers is presently Professor of Cultural and Postcolonial Studies at the Oriental University in Naples where he has been Director of the Centre for Postcolonial Studies, and presently coordinates the PhD programme in ‘Cultural and Postcolonial Studies of the Anglophone world’. Professor Chambers has a degree in History and American Studies from Keele University, and subsequently acquired an MA at the Centre for Contemporary Cultural Studies at the University of Birmingham. He has lived in Naples since 1976, and has held visiting professorships at Hunter College (CUNY) in 1990, the University of Oslo in 1992, in Emphasis in Critical Theory, University of California, Irvine in 1995, and at the University of California, Santa Cruz in 2008. He has also been a Rockefeller Fellow at the Center for Cultural Studies, University of California, Santa Cruz in 1994; been invited as Visiting Scholar at the Getty Institute, Los Angeles for the year 1996-7; and been a Humanities Research Institute Fellow at the University of California, Irvine in 1997. He is author of Mediterranean Crossings: The Politics of an Interrupted Modernity (2008). He is also editor with Lidia Curti of The Post-colonial question: Common skies, divided horizons (1996,) and the volume Esercizi di Potere. Gramsci, Said e il postcoloniale (2006). In addition Professor Chambers has served on the editorial boards of Formations, Popular Music, Cultural Studies, Communal Plural, New Formations, Postcolonial Studies, and Third Text.